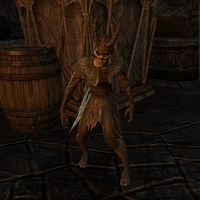 Skaafin Witchlings are hostile humanoid Daedra found in Vvardenfell and Clockwork City. They are smaller than most Skaafin, being similar in size to Skaafin Miscreals or Wretches. A reddish-black magical attack which is thrown at the target. This page was last modified on 4 January 2019, at 02:31.